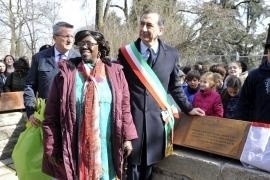 Following we publish the speech made by Mrs. Rahab Mwatha during the ceremony at the Garden of the Righteous of Milan, when we dedicated a plaque to Mrs. Wangari Maathai. Allow me to first thank the organizers for this wonderful opportunity. I also want to thank Gariwo and the Association for the Garden of the Righteous, whose idea this was to honour my dear friend, Professor Wangari Maathai, winner of Nobel Peace Prize 2004. I met with the late Professor Wangari Maathai at the University of Nairobi. In the early 70's we were both employees of the University of Nairobi (UON). I was in Central Admissions and she was a lecturer in the Faculty of Veterinary Medicine. I happened that both of us were involved and interested in women's development, peace and democratisation hence joined existing national and regional women Organisations like Maendeleo ya Wanawake, University Women Association, Kenya Women Society, Girl Guide Association, Federation of Kenya Women Lawyers, PCEA Women’s Guild and many other organisations in the National Council of Women of Kenya, which at the time was acting as overall head of women’s organisations in Kenya. Professor Wangari Maathai was elected to lead the environment committee of NCWK, where she highlighted environmental issues thereby creating the Green Belt movement as there was a lot of tree cutting for building materials, charcoal burning and also through road works in many parts of Kenya. In 1977 she organised a tree planting ceremony in Kamukunji, Nairobi. She was elected to spearhead the Environmental Committees and I was the Secretary. The committee worked closely together on the tree planting programme under Wangari’s leadership. In 1979 Wangari Maathai was elected as the Chair of the National Council and I was elected as a National Secretary (NCWK) in 1997. Wangari was also recognized by many other organizations including the UNEP. Wangari was such a leader, a mentor, a great friend and a mother to be admired and through her leadership was followed by many in her own country (Kenya) and the world at large. Prof Wangari was also a member of the Kenya International Liaison Centre and presented information about the environment in the NCWK. She acted as an Assistant Minister for Environment and Natural Resources between 2003-2007. At the time of the founding of the Green Belt Movement 40 years ago, Wangari Maathai was the Chair of the National Council of Women of Kenya. The issue of protecting the environment has been and remains a major priority in my country Kenya and around the world. According to the United Nations Environment Program, (UNEP) deforestation in Kenya’s Water Towers deprives our economy of 6 Billion Shillings Annually and threatens more than 70% of the country’s water supply. UNEP data further tells that Kenya’s water towers and forests contribute more than 3.6 per cent of national GDP, and the economic benefits of forest ecosystem services are more than four times higher than the short-term gains of deforestation. Preventing the further destruction of Kenya’s forests and wetlands and investing in their restoration and sustainable use is one of the smartest and cost-effective natural capital investments Kenya can ever make – this would not only combat climate change, but also create jobs, wealth, ensure water and food security, and deliver Vision 2030. New data released recently by the Green Peace GIS Laboratory, the University of Maryland & Transparent World, in collaboration with the World Resources Institute and WWF Russia showed that more than 104 million hectares of the world’s remaining pristine Forest Landscapes — an area three times the size of Germany — were degraded by human activity (fires, logging, road-building, and agriculture) from 2000 to 2013. In Kenya this was projected to rise by 4.9% by 2017 steadily to 5.8% by 2019. Intact Forest Landscapes are some of the most important landscapes on earth, and their degradation has devastating consequences for biodiversity, human livelihoods and the climate. That is why the story of the Green Belt Movement in Kenya is so important. Founded in 1977, it’s mission was clear - to respond to the needs of rural Kenyan women who had reported that their streams were drying up, their food supply was less secure, and they had to walk further and further to get firewood for fuel, building and fencing. The Green Belt Movement encouraged the women to work together to grow seedlings and plant trees to bind the soil, store rainwater, provide food and firewood, and receive a small monetary token of appreciation for their work. The project blossomed and in 2004, for her transformative leadership at the Green Belt Movement, it’s Founder, Prof. Wangari Maathai received the Nobel Peace Prize. Shortly after beginning this work, Prof. Wangari and her colleagues begun to appreciate that there was something more going on in Kenya’s landscapes- they saw that behind the everyday hardships faced by communities in rural areas were deeper issues of disempowerment, disenfranchisement, political and economic mis-governance, inequality and an erosion of values. These elements had previously cushioned and enabled communities to protect their livelihoods, work together for the mutual benefit of all, and to do so both selflessly and honestly for the common good. Today, in part because of the Green Belt Movement’s own work, we understand much more completely the linkage between deforestation, governance and peace, about how these three pillars form the foundation for sustainable development. In more recent years, the work of the Green Belt Movement is focused on the restoration of Kenya’s degraded landscapes, knowing full well that our survival depends on the integrity of these forest ecosystems. I am proud of the work of the Green Belt Movement and honored to have served as the Secretary to the Board for many years. The late Professor Wangari Maathai was a jovial and very friendly person to all. So, I guess what I’m trying to say here is…and this is according to Professor's words and not really my own words, “Don’t forget to smile and laugh every day, even when times are hard"... She would tell me when I was going through a tough period: "Problems that you are experiencing now are like a river - They are "Just passing and flowing by"meaning that problems will flow away. That’s also why I am delighted to be here, representing the Green Belt Movement to say thank you for this great honor. To be here on a day that has now become an important day in the calendar of Milan is special. I do not want to close my remarks before I bring personal greetings to you from Wanjira Mathai, Wangari Maathai’s daughter who wanted to be here today. She personally asked me to represent her and the GBM knowing that our connection is deep and wide. In closing, allow me thank you once again, on behalf of the Green Belt Movement in Kenya for this wonderful honor. We look forward to being back in Milan to see the garden growing.